The castle is a luxury hotel/retreat with no (non-resident) public access whilst its position, on a cliff edge, makes it difficult to get a close view of the structure. Nevertheless the castle can be seen from across the bay with the best views from the Kilchoan Ferry Terminal. Castle is now a private luxury hotel. Mingary Castle Layout. The castle was a simple enclosure fortification protected by a substantial curtain wall. Notes: The castle can be viewed from a distance from the Kilchoan Ferry Terminal which is found on Pier Road off the B8007. There is a small car park in the vicinity. The most westerly fortification on mainland Britain, Mingary Castle was built by the MacDougalls and occupied by them until their downfall at the hands of Robert the Bruce. Later it was owned by Clan MacIain who fought off attacks by the MacDonalds, the MacLeans and sailors of the Spanish Armada. Dominating the Ardnamuchan peninsula, Mingary Castle was built in the thirteenth century possibly on the site of an earlier fortification. In the preceding century the entire area, including much of the western coast and the islands, had been under Norse control through Somerled, Lord of Argyll. Upon his death his vast territories were split between Ranald, who would become the founder of the MacDonald clan and later Lords of the Isles, and Dugald who started the MacDougall line. It was a member of the MacDougall clan who constructed the stone curtain wall of Mingary Castle probably in the early 1200s contemporary with similar castles at Dunstaffnage, Kisimul (Barra) and Tioram. It derived its name from the Gaelic word Mioghairidh meaning “land between the machair and moor” in reference to its location at the point where the fertile sand pastures of the western coast meets with the dark peaty inland soil. Although today the location seems remote, the site was once on an important trading route between the Hebridean islands and the settlements in and around the Sound of Mull. At this time the lochs and rivers of Scotland were the highways of their time facilitating access for goods and people through otherwise difficult terrain. The castle was initially raised as an enclosure fortification with a substantial curtain, configured to a hexagon layout, surrounding a courtyard. To the vulnerable landward sides the wall was nearly 3 metres thick, 14 metres tall and supported by a ditch cut out of the rock. Within the courtyard the main range was on the north side whilst the land entrance was on the north-west. A south gate provided access to a steep descent down the cliff to ships below. Mingary Castle formed part of the Lordship of Ardnamurchan which in 1293 was owned by Alexander MacDougall, Lord of Argyll. He was a strong supporter of John Balliol and opposed the rise of Robert the Bruce who had sided with his regional rival, Alexander Og MacDonald. After Balliol’s overthrow by Edward I, Alexander married a daughter of John Comyn, Lord of Badenoch who in 1306 was infamously murdered by Bruce in Greyfriars church in Dumfries. The subsequent rebellion, which saw Bruce seize the Scottish throne, saw Alexander dispossessed and he ended his life as an exiled pensioner in the court of Edward II. David II granted Ardnamurchan, including Mingary Castle, to Clan MacIain and this was confirmed by Royal Charter in 1499 following their support to James IV during his campaign against the MacDonalds, Lords of the Isles. During this conflict the MacIain chieftain had killed Sir Alexander MacDonald of Lochalsh and this started a bitter feud between the two factions. In 1515 and 1517 the MacDonalds attacked Mingary burning the castle and laying waste to MacIain lands. In 1519 Donald Gallda, son of the murdered Sir Alexander, killed the MacIain chief. This marked the end of their direct control of the castle as his daughter, Mariada, later sold it to Colin Campbell, Earl of Argyll. Despite earlier conflicts, the Campbells were allies of the MacIains who continued to reside at the castle. A member of the clan was certainly resident in 1588 when remnants of the Spanish Armada, which had been sent to invade England but had been defeated by the weather and were being blown around the north of Scotland, attempting to return to Spain. 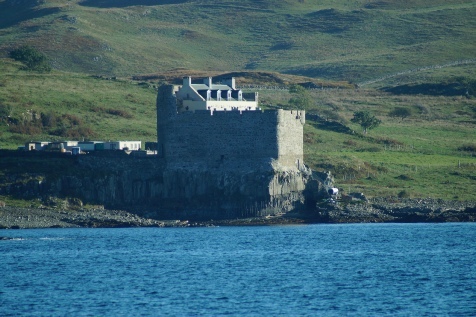 Short of supplies, the captain of the Galleon Florida struck a deal with the MacLeans of Duart Castle (on Mull) for fresh provisions and water in exchange for assisting in an attack on Mingary Castle. The attack was duly carried out, albeit unsuccessfully, and today the inlet below the castle is still known as Port nan Spainteach, port of the Spanish. The Campbells conspired against the MacIain’s in the early seventeenth century. Around 1618 they persecuted them as pirates and drove them out of Mingary Castle. Thereafter it was occupied by Campbells who, in the eighteenth century, substantially rebuilt it. The north range was converted into a four storey tower whilst a kitchen range was added to the west. A further range was built in the south-east. In 1745 the landing of Prince Charles Edward Stuart (Bonnie Prince Charlie) at nearby Moidart saw the start of the final Jacobite rebellion. The Campbells were strong supporters of the Government and a detachment of troops was hastily deployed to Mingary Castle. 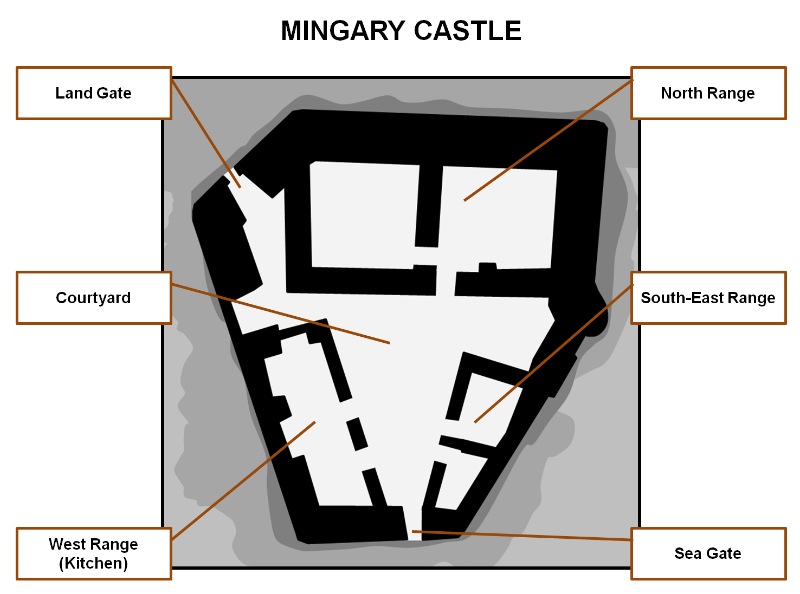 Nevertheless the castle saw no action and, in the years that followed, the surrounding area was cleared with Mingary becoming a remote and isolate ruin. It has now been converted into a luxury hotel.